Looking Back at the ODBD June Release! Today, we are taking a look back at the ODBD June Release! The silhouettes are so sweet! My project features the Sister in Christ set. I stamped it onto a background I had made a long time ago, with tissue paper. I framed the image with a frame I made with an ODBD Square die and the new Flourishy Frame. The sentiment is cut out with a Pierced Circle. The designer papers are from the Old Glory Paper Pack. I finished the card with a tiny blue bow. head over to the ODBD Blog HERE. Welcome to the Our Daily Bread Designs June New Release! 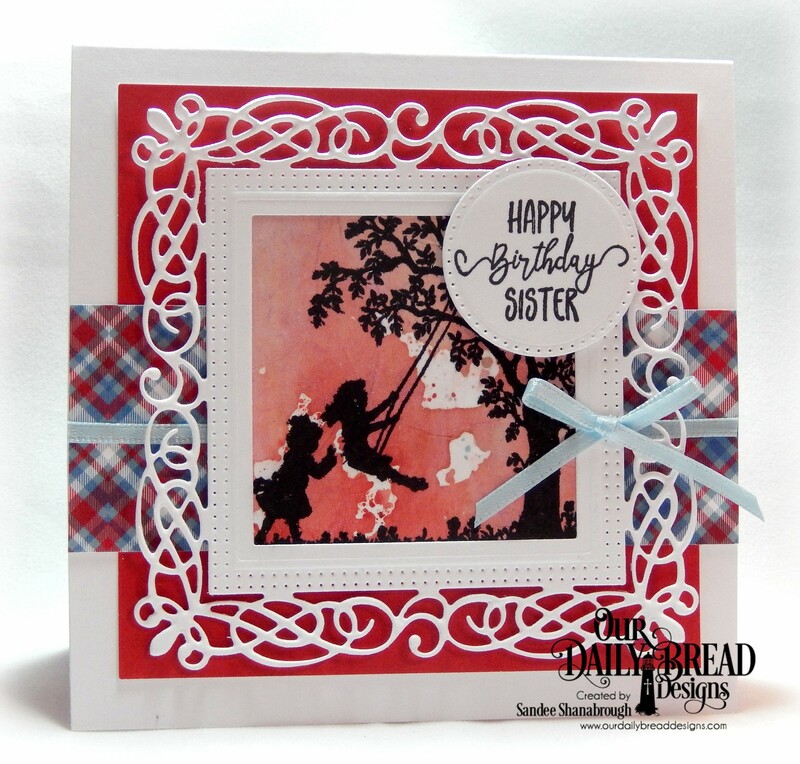 My first card features the new set called Sister Time along with the new Lacey Corners Dies and the Inspiration Words dies. The silhouette image is stamped in pink. I cut the main panel out with a Pierced Rectangle and was able to tuck the corners into the corners of the Lacey Corners die. I cut out the word Hugs and one of the smaller dies in the Lacey Corners Die set is the frame. I added pink rhinestones and a white seam binding bow to complete the card. 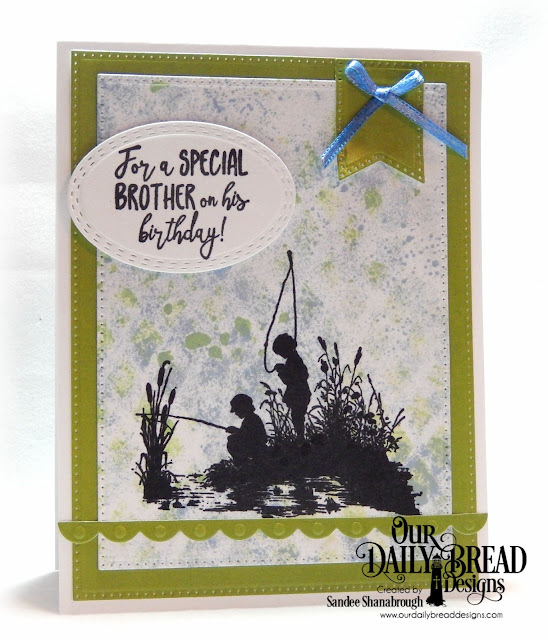 This card features the Brother in Christ set. First I created a background by making a paper stencil with the Lattice Background die and sponging inks onto through the stencil. Then, I stamped the silhouette image and cut the panel out with a Pierced Rectangle. A larger Pierced Rectangle panel cut from Birthday Brights Paper Pad works as the mat. I also cut out a Bitty Border and a Large Banner from the same green paper. The sentiment is cut with an Oval Stitched Rows die.